TOKYO, Feb, 25 2019 - (JCN Newswire) - NEC Corporation (TSE: 6701) has announced its provision of a facial recognition system via NEC Taiwan Ltd. to E. SUN Commercial Bank Ltd. (E. SUN Bank), a major Taiwanese bank. This system will contribute to the creation of safe, secure, and convenient Automated Teller Machines (ATMs) using facial recognition. These are the world's first facial recognition automation ATMs with one-time password technology(1). E. SUN Bank has installed and begun operation of the ATMs at five locations in Taiwan. The system being provided by NEC utilizes its flagship facial recognition artificial intelligence (AI) engine, "NeoFace," featuring the world's highest recognition precision(2) and belonging to NEC's portfolio of advanced biometric authentication technologies, "Bio-IDiom." 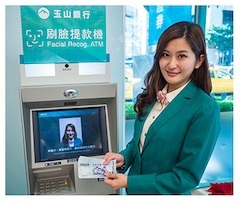 When using these facial recognition-equipped ATMs for the first time, users insert their cash cards and have a photo of their face taken with a camera installed within the ATM. To enhance the safety level of service, users have to correctly enter a one-time password which is sent to their mobile phones within 60 seconds before their images are registered. Once registration is completed, users can only withdraw cash by facial recognition and PIN authentication. In addition, NEC's anti-spoofing technology prevents fraudulent activities at these ATMs by using AI to detect whether a subject is a real person or just an inanimate photo, image or mask. "NEC focuses on the Social Solutions Business, and we will make use of this achievement to realize a safe and secure society," said Takashi Yoshida, general manager, Safer City Solutions Division, NEC Corporation. "NEC will continue proposing innovative new solutions using biometric technologies, both in Taiwan and around the world."